Opportunities are plentiful for job seekers currently, and with unemployment rates at record lows and job openings near record highs, now is a great time to explore job options. With that being said, because opportunities are plentiful, losing valuable employees can be more costly than hiring a new one, so employers are more likely to extend a counter-offer to keep you on board. The increasingly common question is, should you accept your employer’s counter-offer, or move on to a new opportunity? Career best practices generally advise against accepting a counter-offer for a number of reasons. 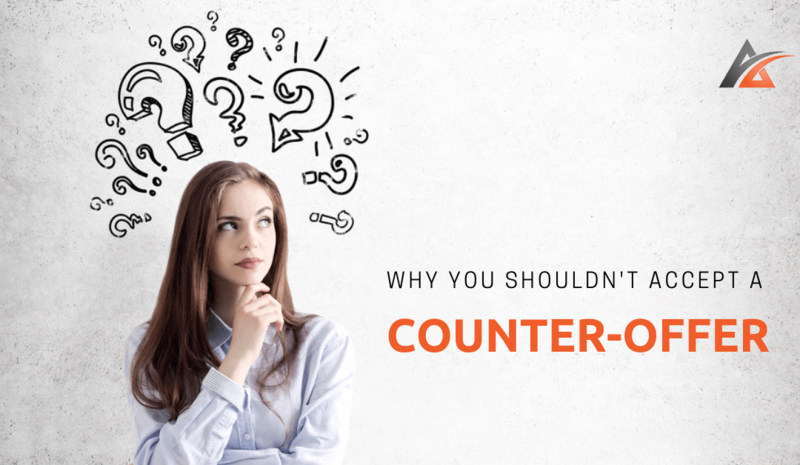 Here are four reasons why it is not a good idea to accept a counter-offer. Things don’t go back to normal. Employers extend counter-offers in a time of panic, however, after the relief passes, you could find your relationship with your manager and other employees has changed, and not in a good way. You are seen as the one looking to leave and you may be at the top of the list if your company needs to make cutbacks. Delayed recognition. If you’re worth your increased salary, why wasn’t this recognized before you handed in your notice? Part of your frustration from the outset may be that you’re undervalued, and if it takes your resignation for this to be noticed by your manager, you may be better off with a company that is more proactive in helping you fulfill your career goals. Money won’t fix intangibles. There is a reason you started your job search. While money can be a motivator, more often there are other reasons that drove you to look for a new opportunity: personality fit, management style, lack of recognition, company culture, boredom, under-compensated, etc. Most likely those factors aren’t going to change, and it could be only a matter of time before you feel the same way about your job and employer. Doesn’t result in employee longevity. Your employer may just want time to search for a replacement, figuring that it’s only a matter of time until you start your job search again. The average employee stays with a company for less than one year after accepting a counter-offer, and half of them re-initiate a job search within 90 days. Counter-offers tend to be temporary solutions. It’s not because you became more valuable to your employer. It is because they don’t want to deal with the work disruption that your departure could create. One key way to avoid the temptation of counter-offers is to always negotiate your salary and benefits with the new company so that you have everything you want lined up and a counter-offer won’t be as appealing. If you think you are about to get a counter-offer, rehearse your resignation conversation. Be PREPARED. It won’t be an easy conversation and be sure to leave on good terms. You don’t want to burn bridges by listing everything you felt was wrong with the organization and your role. You never know when you will cross paths with your old manager again. Be sure to thank them for the offer and reiterate that while you’ve enjoyed your time with the organization, you remain firm in your decision to leave. The counter-offer situation can be a tricky one to handle and will always need some careful consideration. If you are considering your next career move and wish to discuss the opportunities available as well as how to best prepare for the likely counter-offer, please contact one of the Alliance Search Solutions team members today – (216) 503-2313.